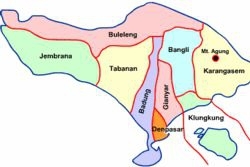 Area: The island of Bali has an area of 5,632.86 square kilometers. The 9 districts are further sub-divided into 51 sub-districts, 565 villages, and 79 local political districts. Bali Islands: There are several smaller islands off the coast of Bali, including Nusa Penida, Nusa Ceningan, Nusa Lembongan, and Serangan Island in the south-east, and Menjangan in the north-west, off the Bali Barat National Park coastline. Galungan, Nyepi, Saraswati and District Arts Festivals are some of the major festivals. Christmas is also celebrated, as in all of Indonesia. Many Bali hotels and restaurants serve Christmas lunch and dinner. May to September, the dry season - or the rest of the year, if you do not mind some rain. See our Things to do section. 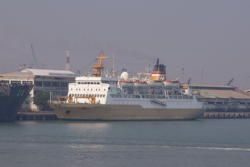 Main harbour for commercial vessels, boats to Nusa Penida, Nusa Lembongan, Nusa Ceningan, Lombok and Gili Islands. Cruise liners dock here. Celukan Bawang, approximately 70 km from Singaraja. Bali lies 3.2 km (2 mi) east of Java, and is approximately 8 degrees south of the equator. Bali and Java are separated by the Bali Strait. To the north of the island is the Bali Sea and to the south is the Indian Ocean. Bali is separated from Lombok, to its east, by the Selat Lombok. Bali experiences pleasant, low-humidity conditions with average daily temperatures between 70 and 93 degrees (21 - 33°C) year-round. The island's rainy season is December through March, with most of the showers occurring in the evening. The island's central mountains include several peaks over 3,000 meters in elevation. 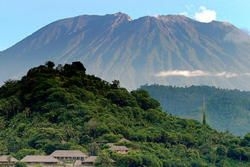 The highest is Mount Agung, standing at 10,328 ft. (3,148 m). An active volcano known as the "Mother Mountain", it last erupted in 1963, with lava flows devastating numerous villages and killing 1,500 people. Bali's volcanic nature has contributed to its exceptional fertility, and its tall mountain ranges provide the abundant rainfall that supports the highly productive agricultural sector. South of the mountains is a broad, steadily descending plain where most of Bali's large rice crop is grown. On the northern side of the mountains, the terrain slopes more steeply to the sea. This is the main coffee-producing area of the island, along with rice, vegetables and cattle. Dozens of very small rivers drain the island. The longest river, the Ayung, flows approximately 75 km. The island is surrounded by coral reefs. Beaches in the south tend to have white sand, while those in the north and west have black sand.